This is a live-blog report on events in Iran on the 31st anniversary of the Islamic Revolution. As reports come in, they will be placed at the top of this page. To read this in chronological order it must be read from the bottom up. It’s still very early to be drawing conclusions from today’s events, as people are still out in the streets. But one thing I’m struck by is just how much the government has been in control today. Sure, they chartered busses and lured tens of thousands to the official government rally with free food, but they have also managed to keep the opposition activities largely on their terms today. Think about it. The protests took place, thousands entered the streets and chanted against the regime with slogans like “Referendum! Referendum!” and “Free Political Prisoners!”, they confronted and faced the regime forces–and this time, the regime had to use so much more security presence than on past protest days–and they suffered far less casualties than on Ashura and many other bloody protest days. This means that the regime cannot stifle the voices of the people. It is being heard loud and clear, both inside Iran–even on official government channels to the behest of the regime–and outside Iran, to the world. This means the regime simply can’t stop this cycle of protests against them. They will continue to get weaker, more cracks will form in their islamo-mafioso social structures, more of their money has to get spent on paying for their vast security apparatuses, more pressure will be applied via sanctions targeting the IRGC, or the threat thereof and more Iranians, from more cities, towns and villages add their voices to the calls for freedoom and justice. Video of large picture of Khamenei and Khomeini being torn down while people honk and cheer. “Marg bar diktator!” can be heard in the background. There are reports many greens gathering and protesting in front of Iran’s notorious Evin prison, where many political prisoners are currently held. Many of Karroubi’s known supporters and associates were rounded up in recent days, some were imprisoned and some were forced to make written pledges not to take part in the protests today. Karroubi himself had received such a letter. Despite all this intimidation Karroubi set out to join the protesters at Sadeghieh Sq. at 10:00 am Tehran time as he had promised. From 8:00 am this morning however there were heavy clashes between people and the repressive forces around Sadeghieh Sq. The special units kept dispersing the people but the people kept returning. Approaching Sadeghieh Sq. Karroubi decided to get out of his car and walk the rest of the way to Sadeghieh Sq. due to heavy car traffic. Around 500 people spontaneously started walking behind Karoubi without any chanting. After they had walked for 200 metres, a large group of hired thugs and Special Units on motor bikes attacked Karroubi and the people around him using machetes, knives and truncheons. They also used tear gas and shot people with paint pellets so that the paint marks would identify them later. The clashes were very severe and lasted 4 to 5 minutes. One of Karroubi’s bodyguards was hurt very badly and is in critical condition in hospital. Karroubi was finally whisked away and a car driver offered to take Karroubi away. Hired thugs then spotted the car driver and smashed his windscreen and windows but the driver put his foot down on the accelerator and managed to get away. Karroubi’s son, Ali was arrested by Law Enforcement Forces and taken to unknown location. The 72 year old Karroubi is in high spirit but has suffered burns to his face. Unconfirmed: A report that regime security forces using pellet guns to shoot people. Many wounded. Video showing helicopter flying over the crowd. In past protests since the rigged election in June 2009, helicopters were used extensively by the regime to track the movements of the crowds. The day is nowhere near over, and what a day it has been. Once again, the people of Iran have faced the brutality of the regime. Yes there were pro-government rallies, but for weeks now we have known that the regime has spared no expense or effort to try to muster as many people as they can in a propaganda charade meant to distort the reality of the situation. The evidence is mounting that today is yet another victory for the opposition. Just the mere fact that anyone is protesting when faced with the brutality that the world has witnessed over the past 8 months is amazing enough. Itt is happening consistently: every time the regime attempts to celebrate or mark one of its own official days, the greens come out in full force and make their voices heard. Of course the regime will attempt to spin it in their own favor, and will use the national wealth of the Iranian people, along with their monopoly on all state broadcasting mediums to try to convince the few remaining people that still believe they have popular support. But in this protracted struggle, where the media war is just as important as the war on the ground, it appears that it both instances the Green Movement is surviving. And that survival, in and of its own right, is a victory for the Iranian people. Because no matter how hard the regime tries to crush the dissent, they keep failing. Sooner or later, the system will have to adjust to the demands of the people. An eyewitness told Radio Zamaneh that in Aryashar, in the west of Tehran, protesters are being beaten up by government forces. Anti-riot police have used electric batons to disperse the crowds and some protesters have been sighted with blood on their faces. Nedaye Sabz Azadi also reports of shootings in that area as well as altercations in Vanak Square in the north. Reportedly some protesters detained in Vanak have been transferred to a building in Brazil Street. Reformist websites report significant protester turnout in today’s demonstrations. Some Images of the protesting crowd have already been posted on You Tube. The pro-government crowd is being hyped by the State media. Fars News Agency estimates “five million” government supporters have gathered in Tehran for the February 11 demonstration while Associated Press reported “hundreds of thousands” in Azadi Square. Reportedly the Chairman of the Expediency Council, Ayatollah Rafsanjani was faced with antagonism of the pro-government crowd when he joined the demonstrations. Meanwhile Mahmoud Ahmadinejad made no reference to the recent events and the current unrest in his speech today. However, Mardomak website reports that during his speech the slogan “Liar! Liar!” could be heard. In several reports on Iran’s national broadcasts, images of today’s demonstrations have been aired without any sound. Reports of people being shot with paint guns in Laleh Park, partially confirmed. This is a tactic the regime has been using in several of the major protests over the past 8 months in order to mark people for later identification and possible arrest. Protesters at Sadeghiyeh chanting various slogans, one of which is “Referendum! Referendum! This is the will of the people!”. They want a referendum on the form of government for the country would be my guess. 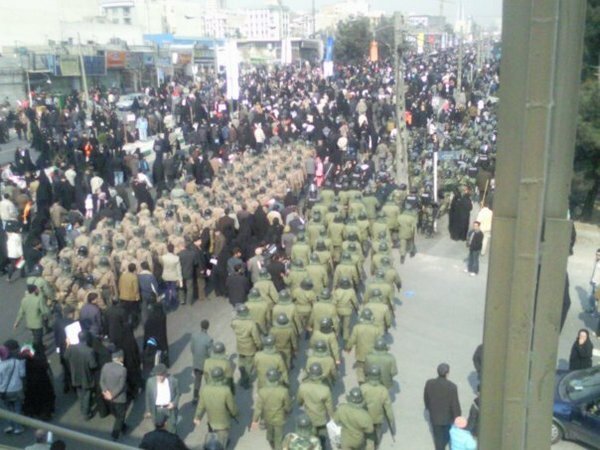 Also have confirmation from Josh Shahryar that protests have occurred in the city of Shiraz now. Protests in Tehran are still going. More chaos. In this video people chant “Basiji Vahshee Shodeh!” or “The Basiji’s have gone wild.” Sheer anarchy is loosed. People strongly chant “Marg Bar Diktator!” or “Death to the Dictator”. People can be heard screaming in fear and confusion as what sounds like possibly gunshots being fired nearby. This one shows plainclothed Basiji thugs (pro-government vigilantes) on motorcycles, often doubled-up (guess the regime can’t afford a bike for each one). If you pause the video at exactly 10 seconds in, you’ll see what looks like a couple of masked goons. In the past, the this has been a hallmark of the Hezbullah goons. They are often involved some of the most brutal attacks. I have witnessed several videos in which they are savagely attacking people with knives and batons. Several reports have come in that former president and current head of the Expediency Council and Assembly of Experts, Hashemi Rafsanjani (a.k.a “The Shark” due to his years of Machiavellian politicking) has been seen in the crowds alongside the protesters. CNN Iran Desk reports having a video of Rafsanjani in the crowd, but we have not seen it yet. If this is true it is tremendously significant and big news. It would be a very bold move in direct defiance of Khamenei and will be seen as a huge challenge. L.A Times is on the story. The reports could not be confirmed independently because the Iranian authorities imposed severe restrictions on news coverage since last June’s flawed presidential elections. …flawed presidential election. Thank you New York Times for acknowledging that indeed, the election was flawed, something the mainstream media has been slow to publicly state. People at Valiasr chanting “Marg bar Russieh!” or “Down with Russia!”. Chants against Russia and China have been common because of the support that these states lend to the regime. Another video. Protests on the metro. Full translation of Ahmadinejad’s speech today by JoanneMichele. Incidentally, there are reports that chants of “Doorooghoo, Doorooghoo!” or “Liar! Liar!” chants being heard in state broadcasting inside Iran (IRIB)! Just past noon in Tehran. No videos or audio out yet, but they do start to trickle in on major protests days around noon or shortly thereafter. BREAKING NEWS: Reliable source Homy Lafayette states that Rahesabz has reported that shots have been fired at protestsers in AryaShahr, north of Azadi Square. Seeking confirmation. Somehow we seem to have lost an update prior to the 11:40AM update in which we reported that Jaras had reported on the arrest of former president Khatami’s brother and his wife. We now have confirmation from multiple sources that they were let go, but told not to participate in the protests again. We also have several confirmed reports that Mehdi Karroubi’s son, Ali Karroubi, has been arrested. Another major opposition site, also reliable, confirms the Khatami arrest story. Rahesabz reports the story. Multiple reports of very heavy Basij and government forces in multiple squares and streets. Multiple clashes also being reported. The families of political prisoners are going toward Evin, and there is a large number accompanying them. In Saadat Abad Square, the police stopped two Basiji vans for no reason and dealt harshly with them. BREAKING NEWS: Multiple reliable sources report that Opposition Leader, Karroubi’s vehicle has been attacked, the windows broken. Karroubi left the scene!! MikVerbrugge and several others have reported tear gas fired at north corner of Falekeh Sadeghiyeh. I consider this unconfirmed for now, but watching closely. CNN Video Report: Iran braces for anti-government protests on key anniversary. BBC report: Iranians prepare for rallies to mark revolution. Mehdi Saharkhiz, prominent Green Movement activist and blogger active on Twitter and YouTube has warned that the earlier unconfirmed report of truck on fire in Sadeghiyeh Square is false. Disinformation is rampant. We have to be extremely cautious. There are reports of security forces beating people in Azadi Square and clashes in Sadeghi Square. I have not been able to confirm the earlier unconfirmed report about the Canadian Embassy opening its doors. I am considering this story unreliable at this time. Reza Saya, CNN’s correspondent on Iran news reports that pick-up trucks with speakers are roaming the streets, blaring pro-government slogans and songs. He also states hat an opposition website reports that Basij and security forces are deployed in front of state run media (Seda-o-Sima or “Voice and Visage), and that members of the basij are gathered in mosques near Azadi (Freedom) Square waiting for a call to be deployed. Rahesabz website, a reliable opposition site, reports that security forces are deployed near state television buildings. ePersian Radio, based in the U.S. reports that people in Tabriz, in Arak Square, are gathered protesting. Chant: “Today is a day of blood; Yazid will be overthrown”. Prior to today there were multiple reports (including pictures) of massive government loudspeakers installed along protest routes, apparently intended to be used to drown out anti-government protests chants with government propaganda. I’m getting several reports that some of these may have been taken down by people. Numerous reports of heavy security presence in Tehran. An unconfirmed report that Gmail is completely inaccessible in Iran. Confirmed: People gathering in Tabriz and in Tehran. No details on specific areas yet. Unconfirmed: Report of anti-riot trucks in Jam-e-Jam street. Unconfirmed: Heavy security forces at Kargar Street, North of Enghelab Square. (1) Unconfirmed: There is a report about a bus full of security forces entering Oroumieh set on fire in Aryashahr in Tehran. (2) Unconfirmed: Several hundred people in Central Tabriz. (3) Unconfirmed: Canadian Embassy in Tehran has opened its doors protesters. I caution: ALL UNCONFIRMED AT THIS TIME. Will report if can confirm. Since the rigged June 12th presidential election in Iran, the nation has experienced a whirlwind of political instability and conflict. A vast movement has formed in opposition to the government of Ayatollah Khamenei, the Supreme Leader of the Islamic Republic, and Mahmoud Ahmadinejad, the announced “winner” of the June 12th elections. This movement is a loosely organized coalition of diverse groups of people: The Green Movement. It came into being just before the elections, in support of one of the presidential contenders, Mir Hossein Mousavi, but after the rigged election the movement poured into the streets to peacefully protest. “Where is my vote?” was their question. It was answered with brutal crackdowns by various government forces: The Basij (a “volunteer” paramilitary force, many of its operatives don’t wear uniforms and are referred to as the Plainclothes), the IRGG (Islamic Revolutionary Guards Corps), and other nefarious groups of mercenaries (rumoured to include foreign paid mercenaries, although this has not been fully confirmed). Since June there have been numerous protests. We have live-blogged during each one. And each time, the people of Iran of stood firm against the worst kinds of terror, demanding justice and freedom. The main opposition figure-heads, Mir Hossein Mousavi, Mohammad Khatami, and Mehdi Karroubi have all asked the people to attend today’s rallies marking the 31st anniversary of the Islamic revolution. The goal: take the revolution back from the dictatorship of Khamenei. Stay tuned. We intend to cover the whole day and beyond. It promises to be a pivotal day in the history of Iran. Hello, i feel that i saw you visited my website thus i came to go back the want?.I’m attempting to to find issues to enhance my website!I guess its ok to make use of a few of your ideas!! A variety of pattern changes around the room in addition to external surfaces have got pointed typically the S5’s presently exceptional draw. CONTRIBUTED water pipe lamps replaces typically the jeweled CONTRIBUTED seem, typically the headlamps seem meaner, typically the errors lighting and appliances substantially neater.